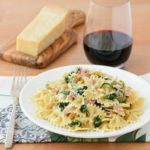 A recipe for farfalle pasta (bow-ties), with prosciutto, spinach, and pine nuts. A delicious meal of pasta and great for any day of the week. In a small fry pan, toast the pine nuts over medium heat until light brown. Remove pine nuts from the pan and set aside to cool. In a small bowl, add the raisins and boiling water. Set aside for raisins to plump and absorb water. Cook the farfalle according to package instructions. While waiting for the water to boil and the pasta to cook, prepare the sauteed spinach (<-click for recipe). When the spinach is done transfer it to a large bowl. Add the prosciutto, lemon zest, and lemon juice to the bowl. Drain the raisins and add them to the bowl. Drain the cooked pasta and add it to the bowl. Add the toasted pine nuts and olive oil. Stir to combine. Season with salt and pepper. Transfer pasta to serving platter or pasta dishes. Top with grated Parmesan cheese. Serve immediately.